Neodymium Bar, block & cube magnets are one of our most popular shape groups for these rare earth magnets. They are all neodymium in all sizes , at all strength levels. These magnets include many specialized forms such as the countersunk magnets that allow you to connect the magnet, using screws to non metallic surfaces such as wood or plastic making them a very useful tool. These rectangular magnets can be long and thin are ideal for cabinet doors keeping them firmly closed even in a moving RV or boat. Square magnets can also have the countersunk screw holes for smaller areas. Smaller neodymium block magnets or cube magnets are great for hobbies and perfect for sewing into the corner of a tea towel to keep handy on the front of the fridge. Larger magnets rectangular magnets have been used in therapeutic venues for the relief of many physical ailments. Neodymium Block Magnets N35,N36,N42,N45, 50 & N52 No matter how you call this category, bar magnets, magnetic blocks, magnet blocks or bar magnets, their basic geometric shape is a rectangle. CMS & Magnets For Sale says the term “block magnet” usually describes a rectangular magnet or magnetic blocks that are commonly used in Toys and various other applications. 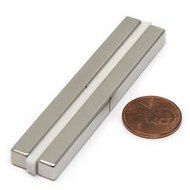 Other terms used when speaking about a rectangular shaped neodymium magnet include magnetic bar, bar magnets or a magnetic strip. Magnetic blocks may be used in industry and labs, and some of the smaller magnetic blocks may be used as craft magnets for many hours of enjoyment. Magnetic blocks used for toys are not extremely strong, but the larger, what you may call “magnetic bars” or “Magnetic strips,” are quite powerful.